Straight out of 'The Simpsons', á la Moe's Bar, this is a place for fans of old football matches and value for money in good company. Which pretty much includes the whole gang from Springfield. Take a break from your one-euro beers at the Formica table in the corner once in a while to play table football or try your luck with the slot machines. 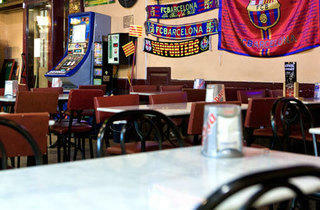 Suddenly the ramshackle bar and cracked walls are soaking wet from a Barça match. Suddenly the walls were wet with drinks and my ears were ringing from the thrill of the footbal fanatics. 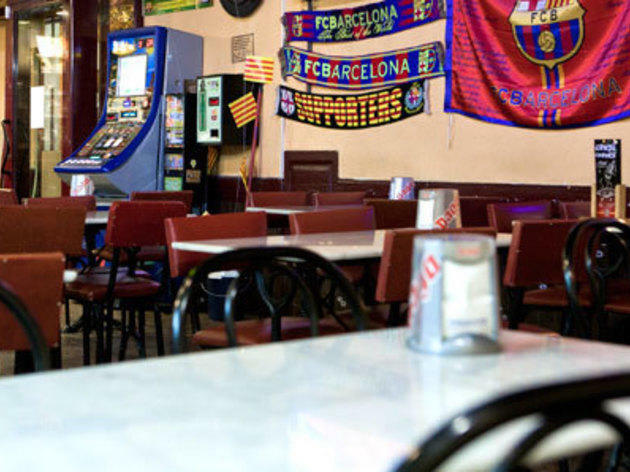 Every time Barça scored a goal, a patron got up onto a table and called out any old cheer through a bullhorn for everyone else to chant along in a frenzy. No doubt Homer would fit right in.